An aerial view of the hurricane barrier, top, and Homer&apos;s Wharf in New Bedford, Mass., shows about 50 gallons of a Dec. 13 petroleum-based spill. Coast Guard response petty officers were investigating the cause of the spill, which covered the majority of the harbor. The U.S. Coast Guard has responded to an increased number of security zone violations around bridge abutments recently in New York Harbor. 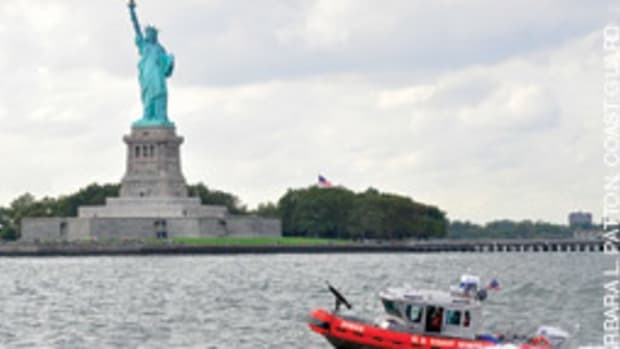 Coast Guard Sector New York and Station New York watchstanders have deployed several boarding teams in recent weeks to interdict boaters who were inside the 25-yard security zone around bridge abutments. The Coast Guard medically evacuated a 52-year-old crewmember from a tugboat near Brooklyn. A rescue boat crew from Coast Guard Station New York responded to a report of a crewmember unconscious on the tug boat Marlin. When the Coast Guard arrived, they found the man unconscious and not breathing. The boat crew performed CPR and used a defibrillator, but he was still unresponsive, according to the Coast Guard. The Coast Guard completed its investigation into the capsizing of Costa & Corvo, which resulted in the death of a fisherman. Coast Guard Sector Boston received a call from a nearby fishing vessel the Mary K stating they had lost visual contact with Costa & Corvo, a 74-foot commercial fishing vessel. At the same time, Coast Guard Sector Boston received an EPIRB alert from the Costa & Corvo. 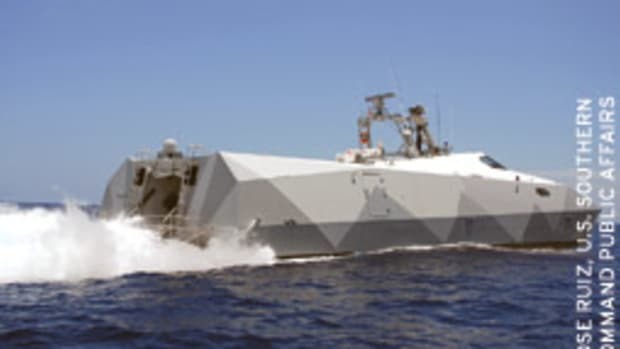 The Coast Guard immediately launched and requested the Mary K proceed to the distress position given out by the EPIRB, according to the Coast Guard. After completing a haulback of a fully loaded fishing net, Costa & Corvo sank about 118 miles east of Nantucket on Georges Bank. It appears the vessel became rapidly unstable as the fishing net was lowered onto the deck. The shifting weight of the catch, excessive water on deck, and closed freeing ports all seem to have contributed to the capsize. The vessel sank about 90 minutes after capsizing. The Coast Guard ended its search for a 47-year old Rhode Island fisherman in Narragansett Bay, R.I.
Coast Guard crews searched for 26 hours for the fisherman, of West Warwick, R.I., covering 284 square miles, but were unable to locate him. The fisherman was angling for quahog clams between Rocky Point and Quonset Point in Narragansett Bay aboard his 18-foot boat when he called a friend from his cell phone stating that his boat was going down and he needed help, according to the Coast Guard. The Kingston Fire Department located the fisherman&apos;s boat in about 20 feet of water about one mile southwest of Patience Island, R.I. 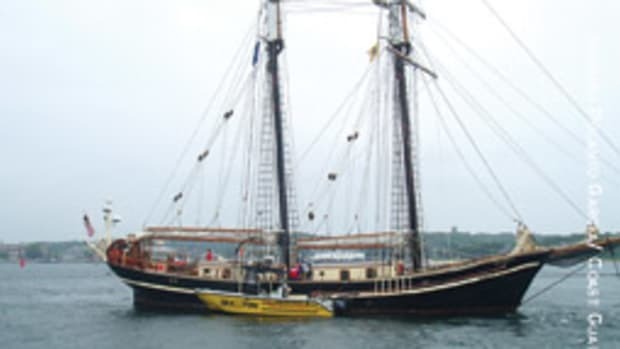 The Rhode Island Department of Environmental Management worked with state divers to raise the vessel, according to the Coast Guard. A Coast Guard helicopter rescue crew airlifted two people from a disabled sailboat 113 miles southeast of Cape Lookout, N.C.
TowBoatU.S. 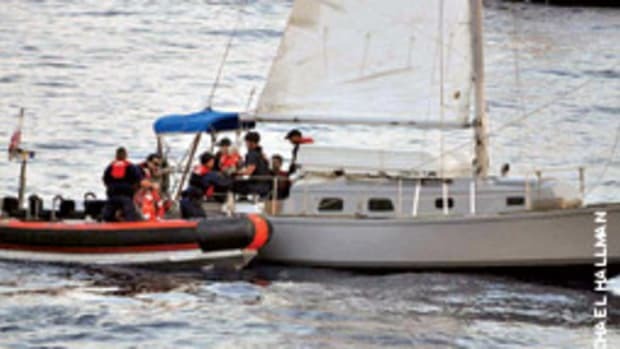 notified Coast Guard Rescue Coordination Center Norfolk watchstanders in Portsmouth, Va., that Wind Song II, a 52-foot sailboat, was in distress with four people aboard, according to the Coast Guard. An HC-130J Hercules aircrew from Coast Guard Air Station Elizabeth City, N.C., was deployed. The aircrew was able to establish communications with the crew of the disabled vessel, who reported that their boat had suffered a mast and rudder casualty. A MH-60 Jayhawk helicopter rescue crew from Air Station Elizabeth City was dispatched to the scene as well. The helicopter rescue crew hoisted two people from the vessel and transported them back to Elizabeth City where they were met by the owner of the sailboat. The two remaining people on the disabled sailboat denied Coast Guard assistance, according to the Coast Guard. Man assisted near Hatteras, N.C.
A Coast Guard Station Hatteras crew rescued a man as waves were breaking over the bow and stern of his 21-foot skiff near Kings Channel Marker 6, a couple miles north of Frisco. Dare County 911 called Sector North Carolina watchstanders and reported that the man&apos;s boat was flooding. The watchstanders launched a 25-foot rescue boat crew from the station who arrived quickly to the anchored boat. The Coast Guard suspended its search for three fishermen whose 44-foot fishing vessel sank 20 miles east of Cape May, N.J. The Coast Guard received an EPIRB transmission from the fishing boat Sea Tractor. A rescue helicopter crew from Coast Guard Air Station Atlantic City, N.J., arrived and found an empty life raft with a strobe light attached. A good Samaritan, fishing vessel Capt. Jeff, arrived to assist and found a debris field with the Sea Tractor&apos;s EPIRB and a cooler. Coast Guard search efforts were coordinated by crewmembers at Coast Guard Sector Delaware Bay in Philadelphia. Rescue helicopter crews from Coast Guard Air Station Atlantic City, N.J., a C-130 aircrew from Coast Guard Air Station Elizabeth City, N.C., and a rescue helicopter crew from Coast Guard Air Station Cape Cod, Mass., all responded to the scene. Crews from Coast Guard cutter Block Island, a 110-foot Island Class patrol boat home-ported in Atlantic Beach, N.C., and Coast Guard cutter Mako, a 87-foot patrol boat home-ported in Cape May, also assisted in the search, but had to return to home port because of deteriorating weather conditions. The Coast Guard rescued two people after the boat they were aboard caught fire five miles east of Manasquan Inlet. 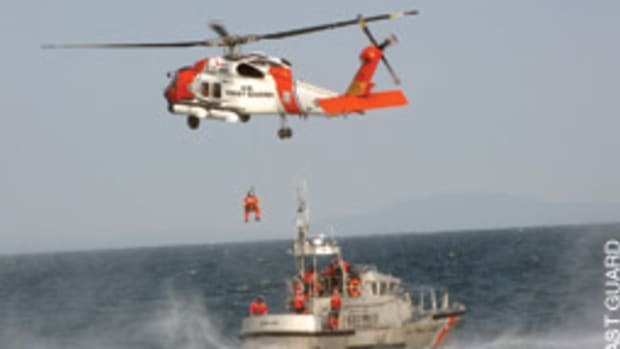 The Coast Guard received a call from a crewmember aboard the boat Finally, reporting their boat was on fire, they were abandoning ship and getting into a life raft. A rescue boat crew from Coast Guard Station Shark River, N.J., arrived, rescued the two people and transported them to Station Shark River, where they were transferred to awaiting emergency medical personnel, according to the Coast Guard. One person suffered from smoke inhalation. The other person had no injuries. The boat&apos;s initial report of its position proved to be inaccurate, but the Coast Guard was still able to locate their vessel using new technology. The Coast Guard suspended its search for a missing fisherman from Pelletier Creek near Morehead City, N.C.
Sector North Carolina watchstanders received a report that a man had departed from Pelletier Creek on a 17-foot Carolina Skiff. According to the man&apos;s son, he left for a fishing trip without informing anyone. Watchstanders issued an Urgent Marine Information Broadcast to notify other boaters in the area and launched two Station Fort Macon rescue boat crews. The 24- and 25-foot rescue boat crews searched Pelletier Creek, Adams Creek, Cape Lookout Bight and outside of Cape Lookout Bight. The watchstanders found that he made a cell phone call during the trip, which was within 14 nautical miles of the phone tower the call went through in Beaufort, according to the Coast Guard. An Air Station Elizabeth City MH-60 Jayhawk helicopter crew arrived and searched inside the cell phone tower range area, Cape Lookout, oceanside of Shackleford Banks, Bogue Sound and Newport River. A Station Fort Macon 47-foot rescue boat crew was also involved in the search as well as the Cape Lookout park rangers, according to the Coast Guard. Coast Guard crews rescued five people from their sinking 47-foot sailboat about 32 miles south of Cape Lookout, N.C. The sailboat crew called Sector North Carolina watchstanders to report their boat was taking on water. The watchstanders launched an MH-60T Jayhawk helicopter crew from Air Station Elizabeth City and a 47-foot rescue boat crew from Station Fort Macon. The Coast Guard rescued two people aboard a disabled sailboat 100 nautical miles off Cape Lookout, N.C. Rescue Coordination Center Norfolk watchstanders received a distress signal from the sailboat Croc, which was transiting from Norfolk to Marsh Harbor, Bahamas, according to the Coast Guard. An Air Station Elizabeth City, N.C., HC-130J Hercules aircraft crew launched and located the distressed vessel. The owner of the vessel stated they were taking on water and requested assistance. 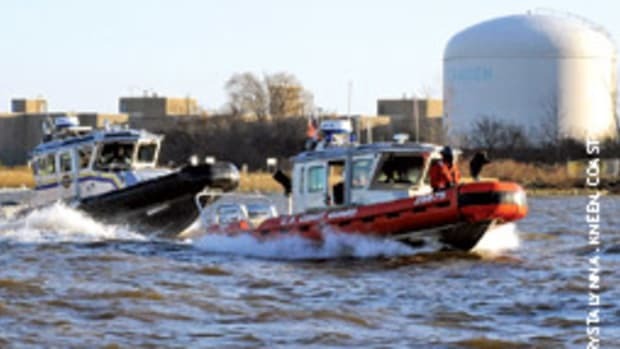 A Coast Guard response boat crew from Station Little Creek in Virginia Beach recovered two unresponsive people from the water about two miles north of the fourth island of the Chesapeake Bay Bridge Tunnel. A boater in the area notified Coast Guard Sector Hampton Roads watchstanders that he saw an unresponsive person in the water. Coast Guard Station Little Creek launched a response boat crew to investigate. Virginia Marine Resources Commission also dispatched a boat, according to the Coast Guard. The response boat crew from Station Little Creek recovered the person in the water and found another person in the water about 300 yards away. The boat crew found both people unresponsive with no vital signs. Both people were brought back to Station Little Creek, where they were transferred to emergency medical personnel, according to the Coast Guard. This article originally appeared in the Connecticut & New York Home Waters Section of the February 2010 issue.